Super Bowl Sunday will kick off bright and early with a celestial team-up between the last quarter moon and the ringed wonder of the solar system, the planet Saturn. To see the planet-moon pairing, which astronomers call a conjunction, start looking low toward the east-southeast horizon shortly after 12:30 a.m. (your local time) on Feb. 3. Weather permitting, soon after the moon emerges from beyond the horizon, you'll notice a bright non-twinkling yellow-white "star" shining sedately above and to its left. If you have any obstructions such as buildings or trees in that direction you might have to wait awhile as the celestial pair slowly climbs higher in the sky. They will be at their highest, appearing roughly one-third of the way from the horizon to the point directly overhead (the zenith) at around 5:30 a.m. your local time. By that time, Saturn will appear about 4 degrees directly above the moon. Your clenched fist held at arm's length measures about 10 degrees, so the moon and Saturn will be separated by roughly less than half a fist. For the past two years, Saturn had been keeping close company in the night sky with the bluish first magnitude star Spica in Virgo, but now Saturn has left Spica far behind. You'll see it about 18 degrees to Saturn's right. And if you look about 5 degrees below and to Saturn's left you may note the star with the tongue-twisting name of Zubenelgenubi (pronounced "zoo-BEN-el-je-NEW-bee") in the constellation of Libra, the Scales. If you have binoculars, train them on Zubenelgenubi and it will reveal itself to be a wide double-star. You'll need more than binoculars, however to bring out the famous rings of Saturn. A telescope magnifying at least 30-power will reveal the famous rings, now tilted more than 19-degrees to our line of sight. Saturn is currently 901 million miles (1.45 billion kilometers) from Earth. On the other hand, the moon is more than 3,900 times closer to Earth than Saturn is, and also moves rapidly to the east relative to Saturn. 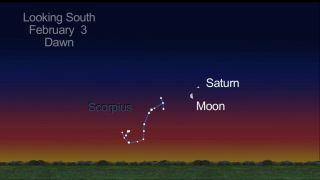 That's why as Saturn begins to fade from view in Sunday's brightening dawn twilight about a half hour before sunrise, the moon will have moved on past Saturn; the planet now appearing above and to the moon's right. Editor's note: If you snap an amazing photo of the moon and Saturn, or any other night sky object, that you'd like to share for a possible story or image gallery, send photos, comments and your name and location to managing editor Tariq Malik at spacephotos@space.com.